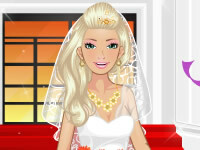 Here at mydressupgame.com, we have a nice dress up game for Barbie weddings. Let's jump in and take a ride into Barbie's world with a look at this fabulous elegant Barbie wedding style dress up game! Have fun!